Three-fer Thursday is back in full swing today after taking a short break to celebrate the Fourth of July last week. As always, thank you to those who linked up. You always make our job of selecting only three to feature so difficult. We are excited to see what you have in store for us this week! So, get linked up and go meet some new blog buddies! Jessie of Fashion Life looks stunning in her coral dress! We love her understated accessories for such a classic chic look. 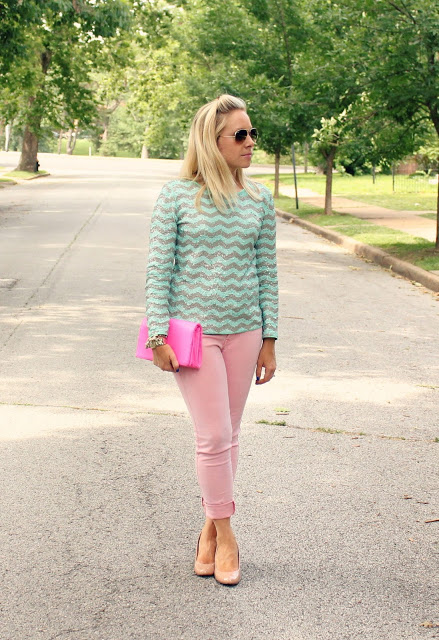 Jacqueline of Stylin in St. Louis paired chevron with pink. We love everything about this look, and her hot pink clutch is the perfect accessory! Liz of Sprinkles & Sequins is sporting chambray with a black and white ikat skirt for a cute, laid back summer look. And her mint accessories are the perfect pop of color. Your post can be about anything fashion related! Think of it as show and tell for your favorite post that you have worked so hard on! We do ask that you please follow Perfectly Coutured and Everyday Fashion and Finance in order to link up. Also, don't forget to post a link back to Three-fer Thursday so that people can come visit! Feel free to use the button below or you can create your own text link if you prefer.